Deluxe Doubles is a family room upgraded. 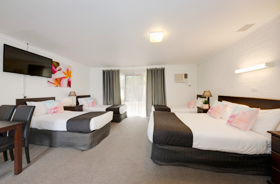 All rooms are ground floor, suitable for both business or leisure, generous sized family room features 2 x Double beds. 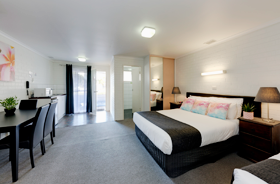 Linen and towels provided tables and chairs, bathroom with shower and toilet and hairdryer and a kitchenette, microwave, kettle, toaster, tea & coffee making facilities, remote controlled television, free wireless internet, ironing board, and clothes airier. Individually controlled reverse cycle air conditioning/heating, on site car parking in front of room. Under cover outdoor area with table chairs. Views and access to the swimming pool and tennis court. Deluxe suite is suitable for the long term guest/overnight or corporate traveller wishing to conduct business from their room. Ideal for one to two people. 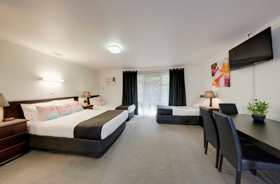 All rooms are ground floor, suitable for both business or leisure, generous sized room features a double and single beds. Linen and towels provided, tables and chairs, upgraded bathroom with shower and toilet and hairdryer and a kitchenette, microwave, kettle, toaster, tea & coffee making facilities, remote controlled television, free wireless internet, iron & ironing board, individually controlled reverse cycle air conditioning/heating, on site car parking in front of room. Under cover outdoor area with table chairs. All rooms are ground floor, Views and access to the swimming pool and tennis court. 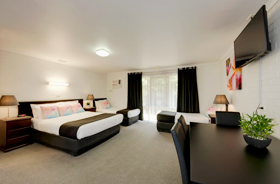 Upgraded suite features double bed. 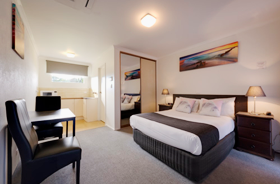 All rooms are ground floor, suitable for the long term guest/overnight or corporate traveller wishing to conduct business from their room. Ideal for one to two people. Linen and towels provided, tables and chairs, bathroom with shower and toilet and hairdryer and a kitchenette, microwave, kettle, toaster, tea & coffee making facilities, remote controlled television, free wireless internet, ironing board and clothes airier. Individually controlled reverse cycle air conditioning/heating, on site car parking in front of room. Under cover outdoor area with table chairs. Large family room. 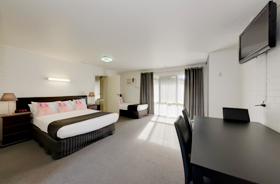 All rooms are ground floor, suitable for both business or leisure, generous sized family room features a double and 2 single beds. Linen and towels provided, tables and chairs, bathroom with shower and toilet and hairdryer and a kitchenette, microwave, kettle, toaster, tea & coffee making facilities, remote controlled television, free wireless internet, ironing board and clothes airier. Individually controlled reverse cycle air conditioning/heating, on site car parking in front of room. Under cover outdoor area with table chairs. Views and access to the swimming pool and tennis court. Large family room. 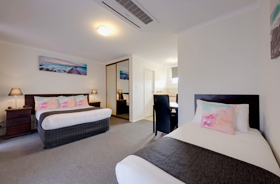 All rooms are ground floor, suitable for both business or leisure, generous sized family room features a double and 3 single beds. Linen and towels provided, tables and chairs, bathroom with shower and toilet and hairdryer and a kitchenette, microwave, kettle, toaster, tea & coffee making facilities, remote controlled television, free wireless internet, ironing board and clothes airier. Individually controlled reverse cycle air conditioning/heating, on site car parking in front of room. Under cover outdoor area with table chairs. Views and access to the swimming pool and tennis court. Large family room. 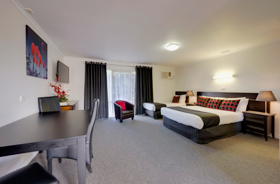 All rooms are ground floor, suitable for both business or leisure, generous sized family room features a queen and 2 single beds. sleeps upto 4 people. Linen and towels provided, tables and chairs, bathroom with shower and toilet and hairdryer and a kitchenette, microwave, kettle, toaster, tea & coffee making facilities, remote controlled television, free wireless internet, ironing board, and clothes airier. Individually controlled reverse cycle air conditioning/heating, on site car parking in front of room. Under cover outdoor area with table chairs. Views and access to the swimming pool and tennis court. Standard suite. All rooms are ground floor, suitable for the long term guest/overnight or corporate traveller wishing to conduct business from their room. 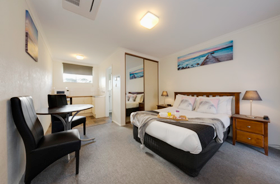 Linen and towels provided, tables and chairs , bathroom with shower and toilet and hairdryer and a kitchenette, microwave, kettle, toaster, tea & coffee making facilities, remote controlled television, free wireless internet, ironing board and clothes airier. Individually controlled reverse cycle air conditioning/heating, on site car parking in front of room. Under cover outdoor area with table chairs. Deluxe studio /connecting suite. All rooms are ground floor, suitable for both business or leisure, generous sized family room features a double and single beds in both rooms linen and towels provided, tables and chairs, both rooms have bathroom with shower and toilet and hairdryer and a kitchenette, microwave, kettle, toaster, tea & coffee making facilities, remote controlled television, free wireless internet, ironing board and clothes airier. Individually controlled reverse cycle air conditioning/heating, on site car parking in front of room. Under cover outdoor area with table chairs. Views and access to the swimming pool and tennis court. Standard suite. Double and single wishing to share a room. All rooms are ground floor, suitable for the long term guest/'s/overnight or corporate traveller wishing to conduct business from their room. Linen and towels provided, tables and chairs, bathroom with shower and toilet and hairdryer and a kitchenette, microwave, kettle, toaster, tea & coffee making facilities, remote controlled television, free wireless internet, iron & ironing board, Individually controlled reverse cycle air conditioning/heating, on site car parking in front of room. Under cover outdoor area with table chairs.